David Tang, Hong Kong Bon Vivant And Entrepreneur, Dies At 63 : The Two-Way Tang was famous for his vast circle of friends — beloved by everyone from British royalty to Hollywood stars to Fidel Castro. He launched the luxury fashion brand Shanghai Tang. 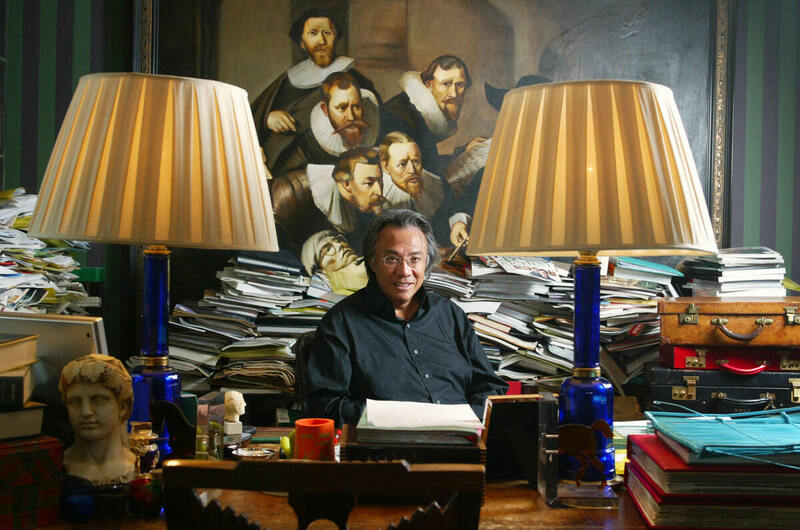 David Tang, the creator of the Shanghai Tang clothing and accessories chain, sits in his Hong Kong office in 2004. Tang has died at the age of 63. David Tang, Hong Kong-born socialite, entrepreneur, philanthropist and impresario, has died at 63. The Financial Times — the British paper for which Tang wrote a weekly column — reported his death on Wednesday, writing that Tang died on Tuesday night in a London hospital. Tang had cancer, the paper notes. Tang founded the luxury fashion brand Shanghai Tang, a glamorous, emphatically Chinese take on high-end apparel. He was an international party, a witty charmer, an Anglophile with a posh British accent and a perpetual ambassador for Hong Kong. The Financial Times, when listing his accomplishments, described him as a "bon vivant" first. Tang was born into wealth and educated in the U.K., where he studied philosophy. He told Management Today in 2012 that his grandfather, a well-known philanthropist built his wealth through a bus company, "said being a philosopher was pointless and that he'd buy me a flat if I became a lawyer." He tried. "I didn't like law," he said. "Every client had a problem, and I didn't want to listen to people's problems; I had enough of my own." Instead, he gambled away that flat, won it back, and lost it again. Then he turned toward other paths — more fun ones. Tang founded a members-only club in Hong Kong, the China Club, that caused an instant stir. Then he launched Shanghai Tang, which he later sold to a Swiss company. He founded a restaurant, China Tang. He owned a cigar distributor (he loved cigars). He recently launched a lifestyle boutique called "Tang Tang Tang Tang," which is not just his name four times, but also a nod to the opening chords of Beethoven's Fifth. Tang seized on the prospect of growth in the Chinese luxury market, and advised other business thinkers to "look east" for future profits. Tang was a triumphant success not just as a businessman, but as a personality. His social circle was vast. He was called the best-connected man in Britain. Earlier this year, British society magazine Tatler said that he might be one of the most popular men in "all history." The Evening Standard described him as a "card-carrying hoot." He was friends with British royals, Hollywood stars, supermodels, politicians ... and Fidel Castro. He once got a tattoo with Kate Moss. He once (chastely) slept with the artist Tracey Emin on a boat in the Adriatic. Political philosopher Isaiah Berlin apparently sat on his knee for an entire opera. Erudite, glamorous, both funny and just plain fun, Tang could be spotted at the hottest parties around the globe, cigar in hand. Tang was also an art collector, a gambler and a music lover, knighted in 2008 for his philanthropic work. "To have known David has changed my life," Sarah Ferguson, Duchess of York, said after his death. "Every time he played the piano or recited a poem, I cried with sheer admiration at such a brilliant mind." "Only a Hongkonger, drawing on the amalgam of British and Cantonese cultures that separates the city from its communist hinterland, would have seen no contradiction in loafing about in a silken mien lap while speaking English in an accent of purest Oxbridge. Only a Hongkonger could have stuck a Mandarin collar on a polo shirt, imbued it with pre-revolutionary chic, and then sold it to the world under the logo of a red, communist star." Fitzpatrick describes Tang as "a sort of debonair Brand Hong Kong, bestriding the international party circuit with Sarah Ferguson on his arm here, Kate Moss on his arm there, waving a cigar while being photographed in the company of a Rolling Stone or a Hollywood great." He planned to celebrate until the very end. When Tang learned he was dying, he planned a big farewell bash at the luxury Dorchester hotel, Asia Times reports. "I thought the best way to go would be to give a party where we can see each other at least one time more, rather than at a memorial service where I shall be dead as a dodo," Tang said. But he passed away before he could have that final fete; it was scheduled for Sept. 6, the AP reports.